Adapting to individual tablets, piGENTLE® ensures gentle automated pneumatic conveying. Taby, Sweden – Conveying speed control technology (patent pending) is the key to the success of Piab's new tablet conveyor. 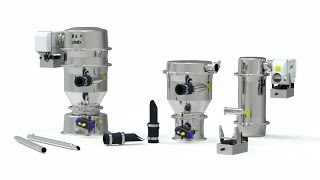 piGENTLE® promises to revolutionise the automated conveying of primarily the pharmaceutical industry's delicate tablets as it sits at the core of the piFLOW®t, the industry's first dedicated tablet conveyor. piGENTLE® adapts the conveying speed to suit individual products, ensuring that tablets are not damaged or chipped. ”The secret of careful vacuum handling lies in a controlled low and constant speed as tablets are transferred from one place to another. piGENTLE® has been specifically designed to ensure that a continuous and gentle flow of tablets is maintained throughout the entire conveying system,” explains Jarno Tahvanainen, Vice President of Piab's Material Handling division. A patent application has been filed for the piGENTLE® technology that regulates the feed pressure of the pump by sensing the vacuum level in the system. As tablets fill up the pipe line, the vacuum level increases, triggering an increase in feed pressure. piGENTLE® will regulate the feed pressure between 2 and 6 bar. A low start pressure allows tablets to be picked up at low speed. The start level can be manually adjusted to suit specific products, according to their size, shape and weight. The piFLOW®t/piGENTLE® technology has undergone extensive testing at Piab's experimental facility in Taby, Sweden. Excellent results have been achieved for several different types of pharmaceutical tablets and capsules. piFLOW®t is an extension to Piab's popular and high quality range of piFLOW® conveyors for powder and bulk materials, and is specially developed to meet the stringent demands regarding operational safety and hygiene within the pharmaceutical (piFLOW®p), food (piFLOW®f), and chemical (piFLOW®i) industries.